I'm quite the Tintin fan and over the years I've managed to gather up all the different Tintin graphic novels that were officially released. It was quite the collecting project but at least it was one with a theoretically finite goal. But additional books have been written about the Tintin books and about the man behind these wonderful graphic adventures and I still seem to be collecting them as well. 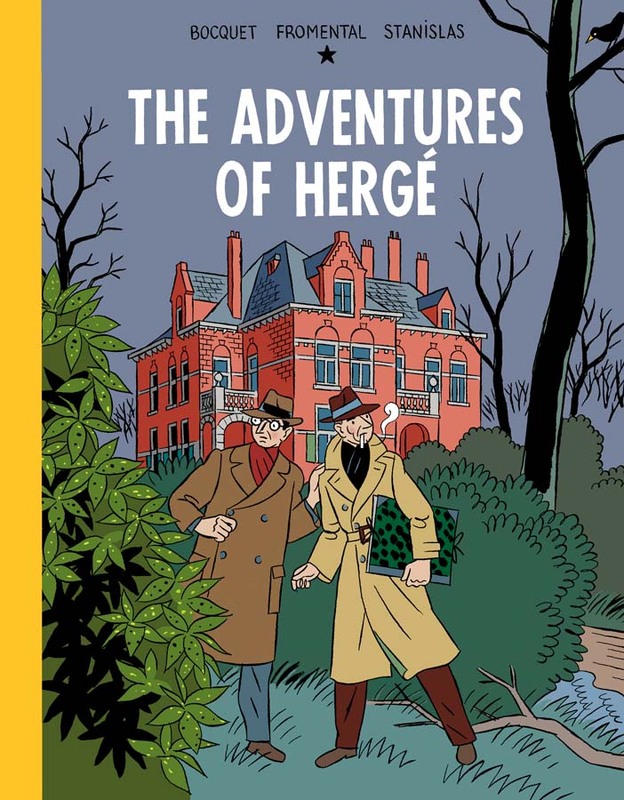 Enter this interesting find, The Adventures of Hergé, which is a graphic biography of the life of the great Hergé. It is done somewhat in the style of a Tintin adventure, which is a rather appropriate way to explore the his life and see how he got into the world of comics. The book feels shorter than I'd have liked, but I suppose that's also because there's a lot of jumping around. You don't spend too much time in each time period (as divided into years) that the authors decided to focus on. So yes, there will be parts that will get skipped, but then again all biographies share that challenge. If anything, this book is always marketed as an introduction to the life of Hergé. If you end up wanting to know more about him after reading this comic, then you're more than free to explore other resource materials. Synopsis: The Adventures of Hergé is a graphic novel biography of the life of famous Tintin creator George Prosper Remi, better known as Hergé. It was written by Jose-Louis Bocquet and Jean-Luc Fromental with art by Stanislas Barthelemy. The comic starts all the way back in 1914 when a 7 year old is first given a set of crayons to preoccupy his time - a simple gesture that leads to a lifetime of creative endeavors. And thus we jump to different points in his life and how he ends up pursuing a life as a comic book artist and eventually how he manages to create our beloved hero, Tintin. We also get a bit of a look at his personal life and the women who managed to capture his heart. The book isn't quite geared for the very young - it manages to depict the fact that Hergé left his first wife for another woman. It also tackles the fact that he was once branded as a collaborator after the war and thus wasn't allowed to create comics for a time. But at the same time it's not a perfect biography since it can only dedicate a few pages to each year that they visit. And in this sense it does feel like a somewhat shallow representative of what could have been. I appreciate the fact that they decided to copy the general style of the original Tintin comics with its clear lines and detailed backgrounds. But at at the same time the art remains fairly distinct from the Tintin comics, and thus it doesn't risk dancing on the wrong side of insult (at least in the eyes of Hergé purists). Regardless of which style is emulate, the comic is quite beautiful and the character styles and the rich coloring really makes you think of the classic comics. At the very end of the book is a complete guide to the major characters in Hergé's life, which is just as well since not everyone is formally introduced over the course of the book. Thus there's a need to flip back and fort sometimes to remember who is who. But at the same time, it's great that the characters still looked so distinct from one another - again more credit to the artist. Definitely one of the greatest moments in the story involves Hergé and his search for his dear friend Chang, the same person who inspired the Tintin character of the same name, It was wonderful to see how the Tintin comics paralleled his friendship with Chang and how the pair were eventually reunited. The Adventures of Hergé is a lovely homage to a great man and an interesting retelling of the major events of his life. It does act as a great introduction to his history and one that certainly encourages you to dig deeper. Thus the comic gets 4 surprise twists and turns in Hergé's life out of a possible 5.